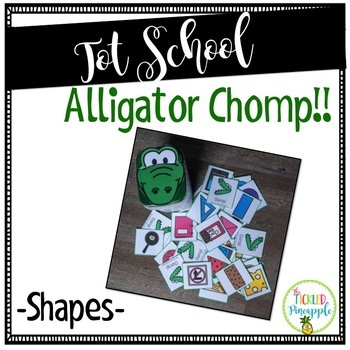 In this easy prep, interactive, small group activity students will practice shape identification while trying to gather the most cards, but watch out!! If they get a chomp they have to put all their cards back in the Alligators mouth. This is a great activity to have on hand when you have a last minute volunteer. It is also a great way for an aide to work with a small group of students on a specific skill. Directions to make the Alligator. 42 different shape cards. If you would like to see this product in action visit my blog: the Tickled Pineapple. Want to be the first to know about my new resources, freebies, and sales? Click on the green star next to my store logo to FOLLOW ME! This way you will receive email updates about all new products and sales!